Technology for global mobility – What’s new? We look at some of the new technology developments that can help make life easier for global mobility, HR and relocation professionals and their relocating employees. 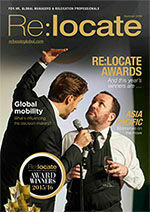 See our special Awards supplement in the Summer 2016 issue of Relocate magazine on our Digital Issues page. In the global mobility sphere, a wide range of cutting-edge new technology products have recently been released, as the entries for this year’s Re:locate Technological Innovation award showed. They covered everything from healthcare, removals and serviced apartments to business travel, home search, and assistance with the wider relocation cycle.The judging team was led by Hannah Stewart, who manages global policies, processes and relocation at multinational mining company Anglo American, and Ezeibe Agomo, senior manager in the mobility business partner team at Sapient Corporation, a previous winner of the Inspirational HR Team of the Year award for its innovative work with management and communications systems.Hannah Stewart said, “Through the submissions for this year’s technology award, it is clear that the global relocation industry is continuing to become more focused on using technology for progressive business transformation, increased efficiencies, improved customer service, and value add for clients.”All the entrants, she added, had demonstrated significant benefits brought by their technology.The shortlist included what the judges described as “diverse and pioneering solutions to current relocation industry challenges” that demonstrated efficiency gains, improved customer experience, modernisation, and added value that went beyond cost savings. The judges were quick to understand the value of the GT Global Tracker from Going-there Global Destination Services, a simple, user-friendly, standalone smartphone app that collates travellers’ data and flags risks across the areas of immigration, permanent establishment, tax and security.Describing the tracker as “a great tool that can be used for companies of all sizes without adding complication to an already complex issue”, the panel said that the app provided an efficient, effective solution to the high-profile issues facing companies needing to track their employees globally.The tracker provides automated alerts where a compliance issue arises for either the company or the employee, with the ability for HR to locate and contact employees in the case of a security threat. Detailed feedback via an HR portal allows detailed reporting to authorities where needed. For more information read the full winner's article. Move Guides’ Talent Mobility Cloud helps companies to manage and deliver their mobility programmes. It interacts with different providers to serve as a portal to manage a range of services, from shipping and flight costings to immigration.Benefits include streamlined administration, easy stakeholder collaboration, and a single mobility view for employees, HR and finance (including tax and payroll).Fully configurable to clients’ programmes, the system supports all mobility policies. HR and mobility users can authorise an employee move, track its progress, access a wide variety of instant reporting, and manage any exceptions or escalations.Employees are given an interactive hub to manage their move, access a task list, learn about their new city and office, and manage expenses. From this, they can access 24-hour customer service from Move Guides’ consultants, wherever they are in the world.Praising the Talent Mobility Cloud’s “slick and professional look”, the judges added that the product was user friendly, with plenty of background information for users. They liked the website’s links to other web-based resources. ICUnet.AG, based in Passau, Germany, provides intercultural consulting and skills development as well as global mobility services.Its multilingual ICU Relocation App is designed to accompany assignees and consultants on their property tour and make it more interactive and structured. A personalised welcome and a video introducing the target culture are part of the package.As an iOS application pre-installed on an iPad, the app gives tailored information on properties, districts and infrastructure in the form of descriptions, codes or pictures. Information on properties in Germany comes mainly from interfaces with estate agents’ websites. A similar arrangement is planned for the UK.Assignees can track their current location via GPS through an interactive online map, which shows nearby facilities, such as schools, hospitals and shops. The map also helps users to judge distances – for example, between an apartment and their workplace.Describing the app as “an innovative and interesting concept”, the judges said that it had “benefits to improve the relocation experience for an employee” and looked “very clear, user-friendly and professional”. Plus Relocation, headquartered in Minneapolis, delivers mobility services in more than 176 countries. Its EloSM for Employees, built on the Salesforce.com platform, is a cloud-based solution that gives relocatees and their partners a single, secure point from which to access information about their move. Through it, they can manage events and tasks, and connect via an online social community with others who are relocating.A version for mobility teams allows clients to: view dashboards of key metrics and access real-time programme reporting; track tasks, message service providers, monitor coming events, or look up information on individual employee moves; authorise new moves, calculate the cost of prospective moves, or review employee survey results and comments; learn about relocation and industry trends; and connect with a community of their peers.The judges praised the “good references and detailed back-up information” supplied with Plus’s entry statement, which, they said, was “very clear and well structured, with issue, action and solution explained and a friendly approach”. They described the website as “a really good community”. For more news and features about technology for relocation and global mobilty, visit our Technology section.